I was recently commissioned for a large art piece in someone's home. 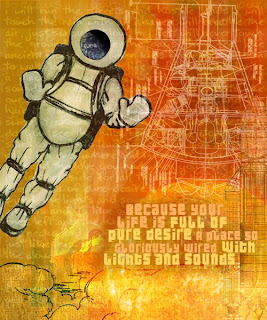 The basic request was a space/astronaut theme with vibrant colors incorporating the quote "because your life is full of pure desire, a place so gloriously wired with lights and sounds." I worked on this on and off for a few months. Working on a commissioned piece is difficult! You have to do your best to present what the client is looking for, and as much as you try to get into his or her mind to see what he or she is envisioning, it can be a gamble. I am happy to say that the final piece was achieved with minimal revisions, and my client is beyond satisfied with the results! The mixed media piece is a combination of sketches, scans of old blueprints, an image from an old children's mystery book, and digital manipulation.